we dedicate this week's photos to a selction of these warblers. 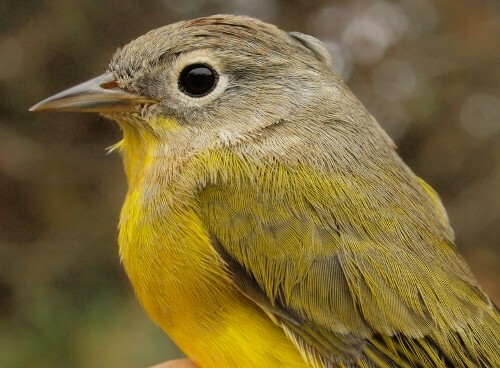 Notes: After two strong weeks of migration, numbers were down in week 10 – the 295 birds banded was fewer than in any previous year except 2011, when we had just 275. However, this week’s results were in large part constrained by rain, which reduced our normal level of effort by roughly 40%. The rate of birds banded per 100 net hours was actually higher this week than any other week this fall. The weather also put a bit of a damper on observations, although the 74 species detected this week was close to our long-term average for this point in the season . Front and side views of an Orange-crowned Warbler (left) and Tennessee Warbler (right), highlighting the subtle differences between the two. Peregrine Falcon sightings at MBO are always infrequent, but traditionally have peaked in early October; sure enough, our first sighting of the year came on October 3. The same day we also saw our first “Yellow” Palm Warbler of the year, and banded our first Savannah Sparrow of 2014. Additionally we saw our first Orange-crowned Warbler and Fox Sparrow of the fall this week . The top three species banded this week are the ones that over the years have dominated week 10. Ruby-crowned Kinglet was the top species this time (as in 2006, 2007, 2009, and 2013), just narrowly edging out White-throated Sparrow, which was number one in 2005 and 2011. 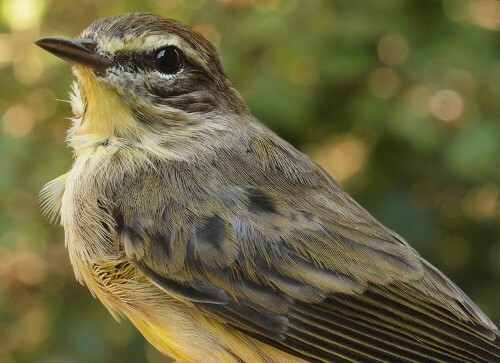 In 2008, 2010, and 2012, the big Yellow-rumped Warbler movements carried over through week 10, but this year the numbers were already down by more than half compared to last week. Slate-colored Junco and Nashville Warbler both increased in rank this week, despite the number of individuals banded declining from week 9. The continued movement of Blue Jays has pushed that species to a new fall record. The half-dozen Black-capped Chickadees banded this week suggests a modest movement of migrants. It was a bit surprising to see Golden-crowned Kinglet numbers drop so low at what is usually close to their peak of migration, but perhaps they will yet rebound next week. Canada Goose remained the most abundant species observed for the third week in a row, and matches historical trends (only in 2012 were Common Grackles more numerous). The mixed blackbird flocks remained a significant presence at MBO this week, but with Red-winged Blackbirds becoming the most prominent species among them, and European Starling dropping back a bit. White-throated Sparrows often are starting to taper off in week 10, but this year the numbers actually continued to increase compared to last week. American Robin numbers are also still growing, while Blue Jays are now just hanging on at the bottom of the top ten. Sometimes there are doubts about whether a Palm Warbler is of the western or eastern (yellow) race, but when we get individuals such as this, they serve as a reminder of just how colourful Yellow Palm Warblers are. Whereas our Saw-whet Owl banding season began very promisingly last week, the migration slowed to a trickle this week. Three nights were rained out, and even when we could operate our program the results were meagre, with between 0 and 3 owls nightly. We also had 4 repeats this week, an unusually high number – suggesting that migration has stalled. 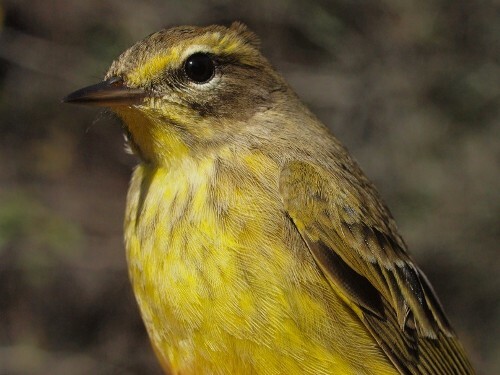 For comparison, here is a Western Palm Warbler, although admittedly a rather dull individual.